Artist’s rendering shows the arched steel adornment that campus landscape architect Christina De Martini Reyes designed for the new span. Christina De Martini Reyes, campus landscape architect, was talking about bridges and the campus’s forthcoming replacement of the La Rue Road span across the Arboretum Waterway. See separate story on the construction project. With minimal budget for aesthetics on the new bridge, the engineers with an outside company suggested incorporating a design into the guardrails. Reyes was thinking “bigger,” not in cost, but “something that would transform the structure into something interesting and beautiful to look at — and something that would minimize the appearance of the concrete bulk of the bridge, necessary for so many reasons but aesthetically uninspiring,” she said. The existing bridge, nearly 70 years old, “is not much to look at,” she acknowledged. But farther east, past the A Street bridge (now Old Davis Road) in the east end of the waterway, she pointed to an older span that speaks to what she was hoping for in the new bridge. 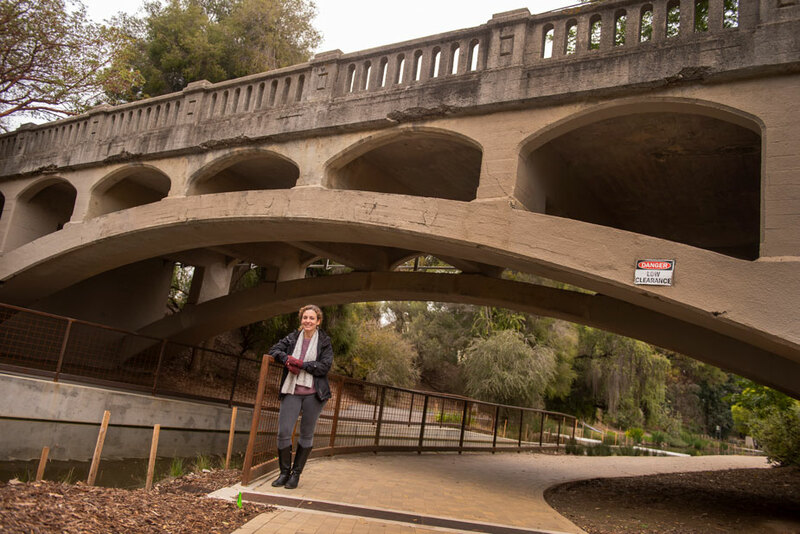 “I spent quite a bit of time looking at it and longing for the days when even small bridges were treated with grace and attention to detail (but also before current safety and structural standards),” she said in an email to Dateline UC Davis. Campus maps old and new do not give a name for the bridge that inspired her. It’s known as the “old concrete arch bridge” to longtime arboretum staff like Superintendent Emeritus Warren Roberts, who added that the span is also known as the Old Putah Creek Bridge (the Arboretum Waterway used to be part of Putah Creek’s north fork until it was diverted to the south), and some people refer to the span as the “old A Street bridge,” even though it does not line up with A Street about 300 feet to the west. Even the railings of the old bridge have arches. Whatever you call the bridge, it has a style — decorative concrete posts and fencelike railings on top of small arches on top of the main arches — that Reyes said provides an architectural feast for the eyes of arboretum visitors as they approach and walk under the span. And she wanted something similar at the La Rue Road bridge. “I felt it was very important to address the view of the bridge from the arboretum paths — to make the bridge a destination of sorts. Architectural drawing shows details of the steel arches that will adorn both sides of the new La Rue Road bridge.